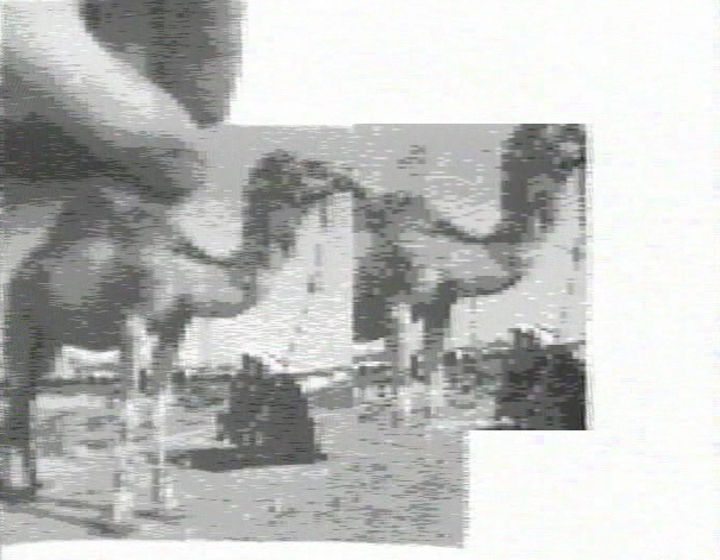 "The Camel with Window Memory piece was made one weekend in the early '80's. I pulled out my post card collection and began to look at specific postcards run through the new digital video buffer I had built together with David Jones. The buffer had only one frame of memory but it was real time. It had the capability of displaying the image memory space, either as live or frozen. Camel with Window Memory was a live performance recording: handheld postcard, stop watch for timing and the live or frozen memory mode switch. A second key input to the buffer determined where the image would be live or freeze. I used two synched oscillators to create the square key clip shape. For sound, I sampled two areas of the image for grey level values that were turned into control voltages to control the Brewster and Bernie Hutchins modular audio synthesizer in the studio. The image and sound changes were live as I turned on and off the image freezing, watched the stopwatch and heard the sound changes as I moved the postcard, reactive, as in looking and listening, real time image and sound recording. The camel and man postcard also was particularly resonant as we were then experiencing gas rationing and gas lines in the states, oil politics of the time then also. I remember reflecting that the camel was historically the traveling water storage unit of the desert, an organic system for storing water, energy and memory."